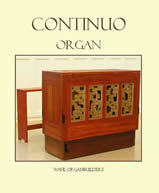 The innovative design of our one-stop continuo organ balances classical joinery and building practice with modern materials to produce a portable, stable, and affordable instrument. 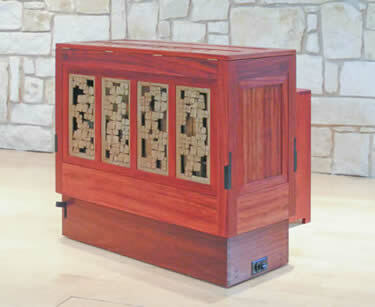 The casework is ruggedly constructed using mortise and tenon framing with dovetail carcass work. 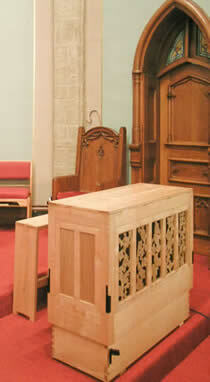 The mechanism and pipework are constructed of poplar and cherry hardwoods and Baltic birch plywood. All elements are carefully and consistently finished to minimize humidity changes. A lift top allows easy access to the pipes, which are winded without tubing to improve focus and eliminate turbulence. The ebony and bone keyboard— placed at a comfortable height to play while standing or seated—sits atop a simple, responsive key action. Oversized pallets and simulated wind consumption produce a comfortable key pluck. 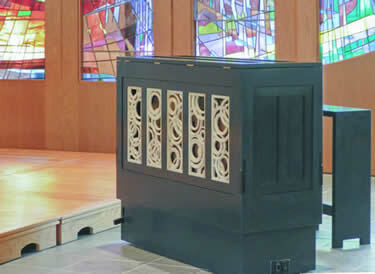 The keyboard retracts inside the casework for protection during movement and storage. A retractable dolly is built in the base around the wind system to move the instrument easily on flat surfaces. The instrument is lightweight with a low center of gravity. With retractable lifting handles, two people can comfortably and safely carry it up stairs.